From the early days of rattles and whistles forward to modern radios and mobiles, these pages present the origin and follow the development of policing in Britain. Steeped in tradition yet advancing with the times, the fascinating histories of these police forces await you here. We are pleased to publish the second issue of our quarterly magazine. 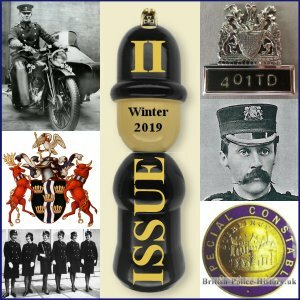 Over seventy pages filled with articles and images about British Policing including the Police Motorcycle from Inception to 1945, the Formation of Radnorshire Constabulary and much more. Do you have photographs of officers or photographs relating to policing in Britain? If you do, we would be delighted to include them on these web-pages. The contents of these web pages, including the BPH logo, and any images, photographs, text, information or material (�the Contents�) are subject to copyright and are the property of The British Police History website (british-police-history.uk) unless otherwise stated.